Friends say Aaron Alexis was a ‘nice guy,’ but police records tell another story. Now 12 people plus the shooter are dead. Ben Jacobs and Miranda Green on Monday’s Washington Navy Yard massacre. Thirteen people are dead in Washington, D.C., after one of the worst mass shootings on a military base in American history. The rampage brought the city to a standstill, grounding flights at Reagan National Airport and forcing schools and the U.S. Senate to go on lockdown. Shortly after 8 a.m., Alexis entered the largest building on the 3,000-person naval base, known as Building 197, and began firing. Patricia Ward, a 53-year old civilian employee at the naval yard, was in the cafeteria when the shooting started. She described hearing 3 shots—“pow, pow, pow”—and then a 30-second pause, followed by 4 more shots. Navy Capt. Mark Vandroff was working in the third-floor conference room when the shooting started. He and his co-workers got down on the floor, and when they stood up, they saw two bullet holes in the wall roughly eight feet off the ground. They stayed huddled there for almost two hours until uniformed police evacuated them. Eyewitnesses described a confusing scene at the Navy yard, with fire alarms punctuated by gunfire, while the naval installation’s intercom system repeated a message that everyone should stay in place. According to D.C. Police Chief Cathy Lanier, the SWAT team was deployed on base within seven minutes. 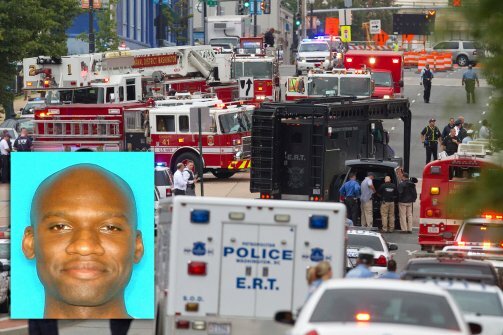 Although the Navy yard is a military base, one employee cautioned The Daily Beast that it shouldn’t be compared to an active-duty base overseas or even a more traditional military installation like Fort Hood, where Maj. Nidal Malik Hasan killed 13 people and injured 30 more in 2009. Instead, the Navy yard is filled with government workers, primarily civilians. The only personnel carrying firearms are law enforcement or security guards. Alexis, a New York City native who served in the Navy from 2007 to 2011, appears to have been following an interest in Buddhism. In Texas, he was a part-time employee at a Thai restaurant called Happy Bowl and was a regular worshipper at a Buddhist temple, according to a restaurant employee. Happy Bowl’s owner, Nutpisit Suthamtewakul, told the Fort Worth Star-Telegram that he had been Alexis’s roommate for three years and also his best friend. Alexis spent much of his free time learning Thai and also enjoyed karaoke and watching Anthony Bourdain. According to Kevin McDaniel, the owner of a used-furniture store in the same strip mall as Happy Bowl, Alexis came into his store about three weeks ago saying he wanted to sell all his furniture because he was moving for Washington for a new job. McDaniel described Alexis to The Daily Beast as “such a nice guy that if he needed a place for Thanksgiving or Christmas that he would have been welcome with my family.” While McDaniel emphasized “it’s not that we double-date or go bowling or anything like that,” he thought Alexis was a friendly person whose only fault was smoking cigarettes. But Alexis also had a history of gun violence, according to two police reports. One incident took place in Seattle in 2004, when he shot the rear tires of a car belonging to construction worker who was working on a building site near Alexis’s home. According to the police report, Alexis fired three rounds from his Glock pistol at the back of the car. At the time, Alexis told police that he had been angered because he thought the victim had mocked him earlier in the day. Following his confession, Alexis told police that he had a “blackout” fueled by anger and didn’t remember firing his weapon until an hour later. His father told police that “these anger-management problems” were the result of PTSD from Alexis’s work in the “rescue attempts on September 11, 2001.” No further details were immediately available. In 2010, Alexis was arrested for firing a gun through the ceiling of his apartment at the Orion at Oak Hill apartment complex in Ft. Worth. According to the police report, a bullet went through the floor and into the ceiling of the apartment upstairs. When police arrived, Alexis claimed that he was cleaning his gun when it accidentally went off. Nonetheless, he was arrested for unlawful discharge of a firearm and subsequently evicted from his apartment complex. Alexis then moved into a bungalow behind the Buddhist temple he attended and was discharged from the Navy after exhibiting a pattern of misbehavior. Even when he worked at Happy Bowl, said Kristi Suthamtewakul, the wife of Nutpisit, Alexis would carry a handgun on the job, concealed by his shirt. After his discharge, Alexis worked as a computer defense contractor in Japan, according to a regular customer at Happy Bowl. He also began studying for a college degree. According to Melanie Hanns, a spokeswoman for Embry-Riddle Aeronautical University, Alexis had been enrolled as a student there since July 2012. He had been taking online courses toward a Bachelor of Science degree in aeronautics and was enrolled at the school through its Ft. Worth campus. Officials still don’t know what motivated Alexis to open fire. At a press conference Washington, D.C., Mayor Vincent Gray told reporters that there was no information that would suggest terrorism was involved. Late Monday night the FBI released the identities of seven of the deceased whose next of kin had been notified. They were all civilians, ranging in age from 46 to 73.